Size: Please Select 14" 14-1/2" 15" 15-1/2" 16" 16-1/2" 17" 17-1/2" 18" 18-1/2" 19" 19-1/2" 20" 21" 22"
White fabric clergy shirt collar: 45% polyester and 55% cotton. 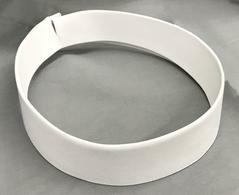 Pontiff #2 collar, 1 1/4" tall. Sold individually or a box of 4 collars. Prices are subject to revision without notice from the manufacturer, please contact us to confirm current price.